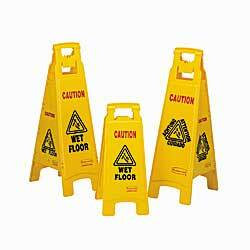 Large, easy-to-see floor signs alert patrons of hazardous areas up to 30' away. Constructed of polyethylene material with maintenance-free hinges. Caution message is hot stampedwon't chip, peel or fade. Choose English or multi-lingual message printed in English, Spanish, French, and German. Color: yellow with black message. SPECIFY MULTI-LINGUAL MESSAGE: A - Caution, B - Closed. IN STOCK.